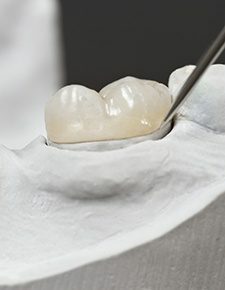 A dental crown is a type of restoration that simply fits over the top of your natural tooth, like a cap. Basically, it can give you a brand new tooth. Crowns can be made from a variety of materials including metal, porcelain, or a combination of the two. Crowns can be used to restore each one of your teeth, and this will determine which material should be used. The front teeth, which are seen when you smile, would probably be served best by porcelain crowns, because they are the most aesthetically similar to your natural teeth. In fact, they can be specially shaded to match the rest of your smile. The back teeth need to be strong, so a metal crown would be recommended more often. It all depends on the needs of your teeth, as well as your personal preferences. The entire procedure can usually be completed over the course of two easy visits. While your crown is being made, you will wear a temporary one. Once your tooth has been fully restored, it may feel slightly more sensitive for a week or so, but you will be able to trust it just like a natural tooth. Dental crowns can last for decades with routine oral hygiene, so be sure to brush and floss consistently. Dental crowns most often fail because the remaining natural tooth starts to decay, so it’s paramount that you keep up your normal oral hygiene regimen. Another way to insure that they last for a long time is to have regular check-ups at Friendswood Dental. If you would like to know more about dental crowns and how they can bring your smile back, please give us a call today. Don’t go through your life feeling uncomfortable and self-conscious because you need to get a tooth repaired. We trust dental crowns can help your smile no matter what condition your teeth are in, so don’t hesitate to come see us.